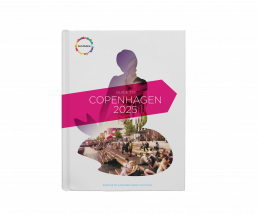 With the ‘Guide to Copenhagen 2025’, we painted the picture for what life will be like for Copenhagen residents of the future when the city’s carbon neutrality goals are achieved. Copenhagen was the first to commit to carbon neutrality by 2025, but it can be challenging for ambitious cities like Copenhagen to bring these plans to life in the early stages and create a sense of community ownership amongst citizens. We developed a vision guide for Copenhagen in 2025, building on existing plans for the city in order to provide a realistic image of the carbon-neutral future. The publication walked readers through aspects of life from waste to transport solutions, showing how a carbon-neutral city can also be a thriving and liveable city. Our approach helped to make distant and intangible goals feel relatable and exciting, and also helped the municipality to communicate their long-term plans more easily. The publication is available to read and download here. We are really proud of the Guide to Copenhagen 2025 – it shows there are huge benefits from … investing in sustainability. 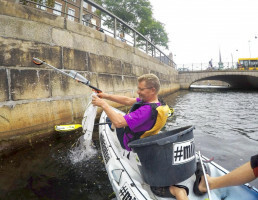 Frank Jenson, Lord Mayor of Copenhagen, cleaning up city’s waterways with the Green Kayak program. The city of Copenhagen is home to over 600,000 people and was the first city to announce the ambition of becoming carbon-neutral by 2025.